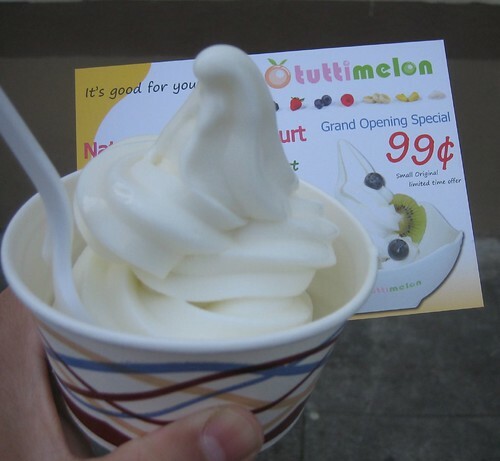 Tuttimelon is yet another Pinkberry knockoff serving sour frozen yogurt with various toppings. I stopped in at the outpost on Irving near 23rd for the 99 cent introductory offer. The yogurt is touted as all natural fat free good for health and digestion well o.k., but the flavor is much more sour than Harmony or Yogurt Bar. It is probably on par with the lemon taste of Pinkberry, but has an odd artificial aftertaste that I don't recall in the Pinkberry version. Without a Pinkberry in San Francisco, it's difficult for me to tell, but I believe the consistency is about the same, with Pinkberry being slightly icier. I've become accustomed to the creaminess of Harmony and Yogurt Bar, so Tuttimelon won't do for my frozen yogurt fix. Though, it might be an acceptable substitute for those that prefer Pinkberry to the other local versions.